As the fourth International Polar Year draws to a close, talk of the legacies that the current IPY will leave in its wake has begun to circulate. Established to respond to the specific needs of students and young professionals in the polar sciences, the Association of Polar Early Career Scientists (APECS) is turning out to be a surprisingly successful legacy of IPY-4. Initially a break-off group of the IPY Youth Steering Committee (YSC) (IPY project n°168) before the two organisations re-combined under the APECS banner in September 2007, the purpose of APECS is to help the new generation of polar scientists make professional connections, share ideas, advance their careers, and continue the important integration of outreach into research projects. Dr. Jenny Baeseman, one of the two founders of APECS, is the Director of the APECS International Office at the University of Tromsø, Norway. The organisation she helped establish in 2006 with Hugues Lantuit of the Alfred Wegener Institute (AWI) has far outpaced expectations, and the stature of the organisation within the international polar research community has been rising steadily. In less than three years, APECS has grown to some 1,400 members worldwide. Finding time in her busy schedule to speak to SciencePoles, the director and co-founder of APECS talks about the organisation she helped create. Where did the idea of APECS come from? The IPY Youth Steering Committee started in 2005 as a way for young researchers to get involved with the activities that were happening during the IPY. The committee was focusing on education and outreach at the time, which is very important, but it wasn't doing much in the way of career development for young researchers. So two of us who were on the committee - Hugues Lantuit and I - decided to split off and create an organisation that had a focus on career development. That was when APECS was born, with the help of Rhian Salmon at the IPY International Programme Office. We wanted to help young polar researchers network internationally and between disciplines, and to network not only amongst themselves, but also with senior researchers to create this continuum of polar leadership that could last beyond the end of the IPY. After many discussions with young researchers it became clear that they wanted both career development and education and outreach. As a result in September 2007 at a meeting in Stockholm (which was sponsored by Serla) the two organisations decided to come back together to form one strong umbrella organisation. APECS is currently made up of you, the Director, an Executive Committee elected once a year and a Council, which is open to anyone. What is the benefit of having a council open to everyone? There are no limits to the number of people who can represent one country on the APECS Council. We don't want to have one national representative from each country; we want it to be as open as possible because that's where the best ideas come from. The Council is made up of the most excited and involved members of APECS and many of them are representatives and even leaders of the national committees. There are also a lot of discipline coordinators on the council, who are in charge of disseminating information about what's going on regarding the cutting-edge research being done in their specific discipline in the Polar Regions. And from amongst the council members we elect the executive committee, which makes sure all the ideas are coming forward and helps make sure that events and activities take place. How is the workload distributed between APECS and the national committees? Each national committee operates independently in its own way. Some of the national committees have a very elaborate structure with treasurers and secretaries, while others are just a bunch of people who get together and share their polar research ideas and experiences. We try not to over-manage the national committees; we prefer to let them figure out what works best for them. Each national committee's representative or representatives on the APECS council share information about what their national committee is doing with the rest of the APECS members. For example, the New Zealand national committee does a lot of education and outreach. For them, APECS helps them to connect to national committees in other countries so they can share ideas and best practices and communicate between classrooms. In this way APECS is an umbrella organisation that ties people and organisations together, creating opportunities for interactions between people on an international level. Are activities organised more by APECS or the national committees? It's about half and half. On a national level the national committees organise events, but on an international level, the APECS Executive Committee and the members of the Council take care of organising. Usually a different person organises an event each time, which is great because it helps develop APECS members' leadership skills and gives them experience working on committees. It gives them an advantage from a career development point of view because it gives them skills they can use in their careers later on, not just something else they can put on their CV. My job as Director is not only to make sure they've taken care of all the administrative details but also to help them get in touch with some of the senior researchers at the event and help them start forming professional relationships. So I act as the link to connect people for these events, do fundraising, motivate young researchers, get the word out about APECS, and do what needs to be done to help our members. How do you go about organising your workshops? We don't have a set way of organising events. Our events usually come about from an organic, bottom-up process. If we come across people who tell us that they're going to a particular conference, we suggest that they organise something. But we also actively seek out conferences at which a large number of polar researchers will be present, like the AGU and EGU annual meetings, as well as the important IPY events. In those cases we actively try to organise an activity at the conference to bring young researchers together and raise their profile a bit. One of the things we've found to be important is to have gatherings of some type connected to larger international conferences whether it's a career development panel, a social event or a workshop, because young researchers usually go to these conferences so there would be no extra travel expenses for them to attend APECS events. It's an option that's there for them if they want to participate, and it makes things easier for them. Imagine you're a graduate student and you go to a conference. You know maybe your advisor and a handful of other people. With five to ten thousand scientists walking around, it can feel a bit isolating. What APECS does is provide a meeting place and a reason for people to get together and get to know each other and share their ideas. It can make their conference experience a lot more enjoyable and it helps keep young researchers engaged and involved. We've got a lot planned for 2009. We're having a career development panel at Arctic Science Summit Week in Bergen, Norway in March, and we're trying to get something together for the SCAR Biology Symposium in Sapporo, Japan in July. We're having our first international conference together with the Association of Canadian Universities of Northern Studies (ACUNS), which will be in Whitehorse, Yukon Territory in October. We're expecting about 300 young researchers from around the world to participate in that event. The UK Polar Network (UKPN) is also having a number of national career development events going on in conjunction with other national conferences in the UK. How do young researchers find out about APECS? Sometimes academic advisors will tell people about APECS events. We basically work by word of mouth. We don't have an advertising budget, but there are a number of really good LISTSERVs out there that can help us reach a large number of people. One good thing about APECS is that young researchers don't have to register for 18 different organisations. They can just register to be a member of APECS and get all the information coming from all the participating networks worldwide. What kind of support have you had from organisations involved in polar research? Both the Scientific Committee on Antarctic Research (SCAR), and the International Arctic Science Committee (IASC) have been extremely supportive. We signed a memorandum of understanding with both of them at the SCAR/IASC IPY conference in St. Petersburg, Russia in July 2008, which officially states that APECS is the pre-eminent group for young researchers. We've been working with both of them to make sure there are young researchers involved in all of the scientific committees as well as the conference organising committees. It's important because it not only allows the younger generation of researchers to give some input but it also helps connect them with senior researchers, which helps form a collegial and a kind of mentor relationship, even if they're not working in the same research area. We're also working on an agreement with the University of the Arctic and the International Antarctic Institute at the moment. In a way they're both umbrella organisations as well, since they connect all the different universities that have programmes dealing with the Polar Regions. We're trying to establish a good working relationship with both. The University of the Arctic has been very supportive of us for quite some time, and right now we're simply trying to make the relationship official. As for the International Antarctic Institute, they're newer and still trying to find their way, so we're forging ahead together. Scott Polar Research Institute in Cambridge and the British Antarctic Survey have also been very supportive of our work. And of course the International Arctic Research Center at the University of Alaska Fairbanks has played an important role in the development of APECS, and still continues to do so, and the University of Tromsø and the Research Council of Norway are currently funding the APECS International Office. How much assistance did you get from the IPY International Programme Office? They helped us a lot. The idea of APECS came from young researchers, but the IPY International Programme Office was supportive from day one, and very much excited and interested in helping us in whatever way they could. They provided a lot of financial support, helped introduce us to important organisations and people and supported APECS members at different conferences by getting them into keynote speaking roles and on planning committees. Everyone at the International Programme Office was instrumental in making sure APECS was recognised as something important and necessary within the polar research community. How would you assess the impact that APECS has had within the polar research community so far? We've been thinking about how to evaluate our impact. I don't think we'll really get an idea of the kind of impact we're having for a few years yet, not until after we start seeing more international collaborations and more interdisciplinary research taking place as a result of our existence. Young researchers have been developing collegial relationships thanks to APECS activities, so that's one concrete impact APECS has been having, although it's still too early to be able to determine the long-term impacts this kind of networking will have. If you think about it, in 2008 we provided opportunities for about 400 young researchers to meet each other through APECS-sponsored activities. We estimate that in 2009 about 650 young researchers will have the opportunity to meet each other, which means that in just two years' time, more than 1000 young researchers will have been able to meet one another and form new friendships that will benefit them as they move forward in their careers. Has APECS met the expectations you had when you first started the organisation? It has far surpassed my expectations. The sheer talent that I've interacted with and the ideas a lot of these young researchers have is impressive. To be able to help them make things happen is what motivates me to get up in the morning. We've gone in directions and done activities I never thought we'd ever have done. Signing a memorandum of understanding with SCAR and IASC was a very important step in moving this organisation forward, and a lot of young researchers have made this possible. To see the large numbers of people who have become involved and the applications we receive to participate in our workshops makes one realise that there's obviously a need for the kinds of activities APECS is doing, and I had no idea of the magnitude of the need before I started this group. It's great to see how fast APECS has been growing. What do you think will happen to APECS after the current IPY ends? We hope to get bigger, better and stronger! IPY-4 was a catalyst for APECS, and we hope APECS will last at least until the next IPY. 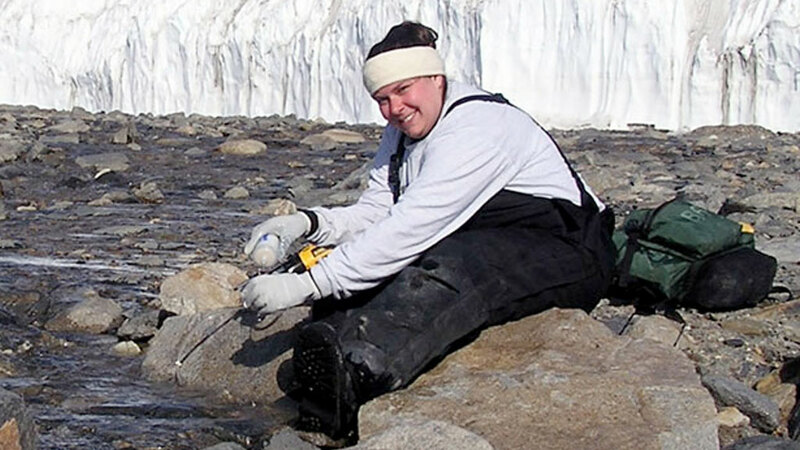 Jenny Baeseman received an MS in Civil Engineering from the University of Minnesota and a PhD in Civil Engineering with an environmental emphasis from the University of Colorado. She also did postdoctoral research in Geosciences at Princeton University. Her research involves studying the survival mechanisms of bacteria in the ‘coolest’ environments on Earth and how we can use their unique biochemistry to benefit society.